Vancouver, British Columbia: January 24, 2019. 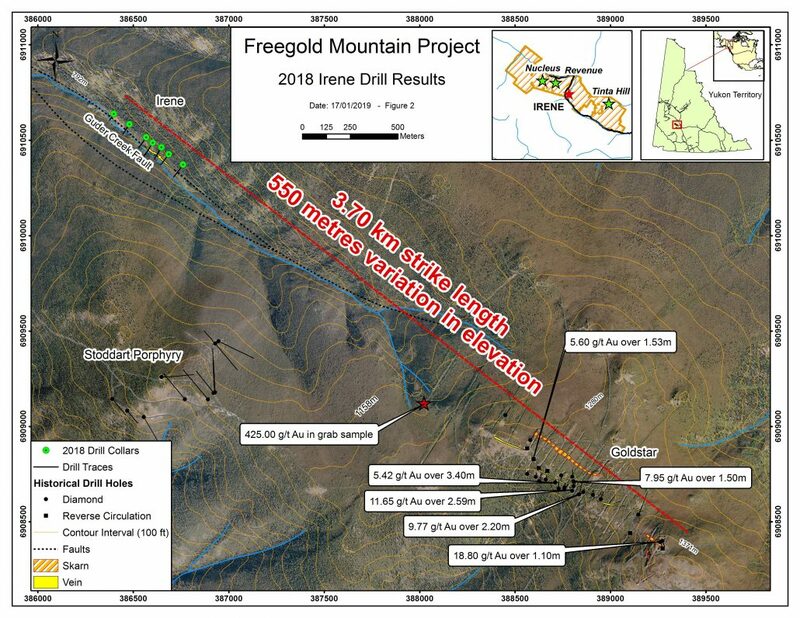 Triumph Gold Corp., (TSX-V: TIG) (OTCMKTS: TIGCF) (“Triumph Gold” or the “Company”) is pleased to announce the results from the inaugural diamond drilling of the Irene gold vein, located on Triumph Gold Corp’s 100% owned, road accessible Freegold Mountain Property, Yukon Territory. The Irene vein was drill-tested over a 450 metre strike length, with 1,369 metres drilled in 11 drill holes. Gold bearing veins were intersected in every hole. 2.38 g/T gold (Au) over 6.13 metres** (IR18-08, 32.72 – 38.85m). 1.15 g/T Au over 19.00 metres** (IR 18-05, 43.90 – 62.90m). 2.19 g/T Au over 5.65 metres** (IR18-18-10, 47.00 – 52.65m). 3.09 g/T Au over 2.00 metres** (43.00 – 45.00m). 2.19 g/T Au over 5.65 metres** (47 – 52.65m). 0.93 g/T Au over 0.95 metres** (62.05 – 63.00m). 1.91 g/T Au over 2.82 metres** (69.00 – 71.82m). 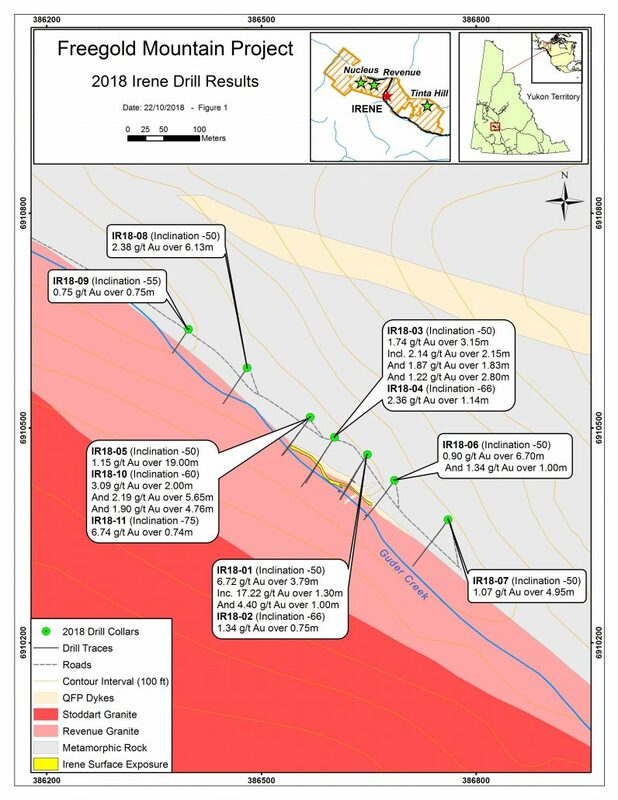 The 2018 inaugural diamond drill program on the Irene gold vein system tested beneath the surface exposures of the vein with drill holes spaced every 50 metres, and tested for along strike extensions beyond the surface exposure with step-out holes located 100 metres to the southeast and 100 and 200 metres to the northwest. Mineralized veins were encountered in every hole to a maximum vertical depth of approximately 100 metres. The intersections define a mineralized corridor that contains multiple veins divided into two types: 1) gold dominant quartz veins and chalcedonic breccias with abundant fine arsenopyrite in multiply re-brecciated quartz, and 2) gold and silver rich massive sulfide veins, composed of pyrite, chalcopyrite, arsenopyrite and stibnite.